It is difficult not to notice the movement involved in saving our bees, and there are some very good reasons to take the preservation of bees seriously. The most important reason is that nearly all of the food we eat relies on them as pollinators. So, even if you don’t want bees around your home or business, it is better to have them moved than exterminate them. That’s where we come in. 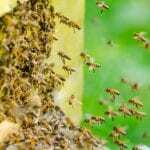 Here at Florida Bee Removal we offer reliable bee relocation services in the Lakeland, Florida area that make you happy and preserve humanity’s food source. There are roughly 20,000 different species of bees, and while all are pollinators, only certain ones are in danger of extinction. In fact, of the four bumblebee species, three are already thought to be gone, and the remaining one is barely hanging on. Luckily, honey and native bees are doing well and aren’t nearly as aggravating or as destructive as other species, such as carpenter bees, which love to burrow into woodwork. Regardless of the species of bee, we will do our utmost to perform bee relocation as all bees are useful for pollination to some degree or another. When you see a bee here and there on your property, thank them for their service and let them continue doing what they do best. The majority won’t bother you if you don’t bother them. However, if you have a swarm, hive, or underground nest of an aggressive species of bee, rather than use DIY methods, call us for bee relocation to give them a chance at life!